Planning approval has been secured for the Hefei ID Mall, a 170,000 sq m retail and office development featuring a 150 m tower, in Hefei, eastern China, designed by global architecture, urbanism and design practice Broadway Malyan. The practice is working in partnership with high-profile client CITIC Capital Holdings Limited, a leading alternative investment management and advisory company – part of CITIC, a state-owned investment company of the People’s Republic of China. The green light will see the practice developing its schematic architectural and retail planning design into a full detailed design according to best international design practice. 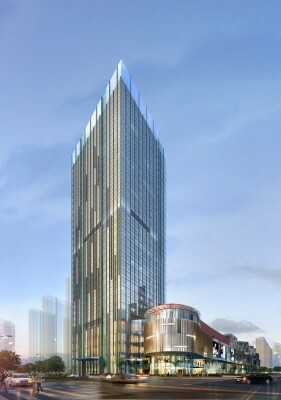 When completed in 2015, the scheme will provide a contemporary 110,000 sq m shopping mall across six levels and 60,000 sq m high-grade office space in a 150 m tower. Drawing on the history of the site, the team’s design philosophy acknowledges the historic building pattern on the site, with the roof garden and restaurants in the new scheme orientated in the same way as the old geometry of this part of the city, whilst also responding to the orientation and location of newer, adjacent developments. The mixing of past and present has resulted in the creation of exciting forms and spaces throughout the building. The overall form is a series of flowing lines reminiscent of flowing water, invoking the area’s name, ‘Bin Hu’ or ‘Lakeside’. Meanwhile, the office tower serves as a strong counterpoint to the flowing lines and is deliberately angular to emphasise the contrast of uses. The design is also highly-sustainable and includes an array of green features such as green roofs and technologies to re-use rainwater and grey water. Hefei ID Mall falls within Hefei’s expansion area and will connect directly to the city’s new metro line to help maximise access for both shoppers and office workers. Earlier in 2013 the practice’s largest retail centre in China, the Lefo Mall Shopping Centre, opened its doors to the public in Suzhou, in Jiangsu Province, Eastern China. 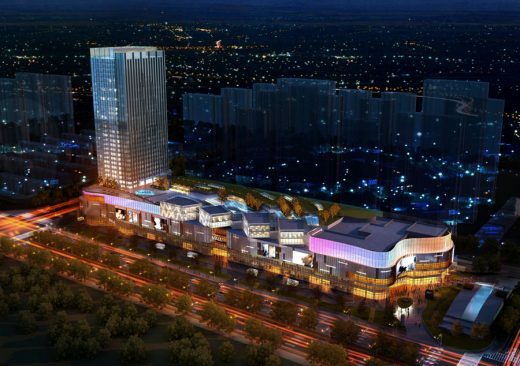 The design for the 65,000 square metre destination mall was delivered for client Suzhou Zhongrun Real Estate. Distinguished by its global reach with 16 studios across world centres, unrivalled diversity with over 450 sector experts and distinctive client focus with over 85% income from repeat business, Broadway Malyan creates world-class and fully-integrated cities, places and buildings to unlock lasting value and deliver a ‘return on design’.